Above: graceful (top of the photo) and enigmatic coral seaweed (bottom). These species are best distinguished by comparison. Enigmatic appears broader, more flattened, and less delicate than graceful coral seaweed. Photos by Joel White. 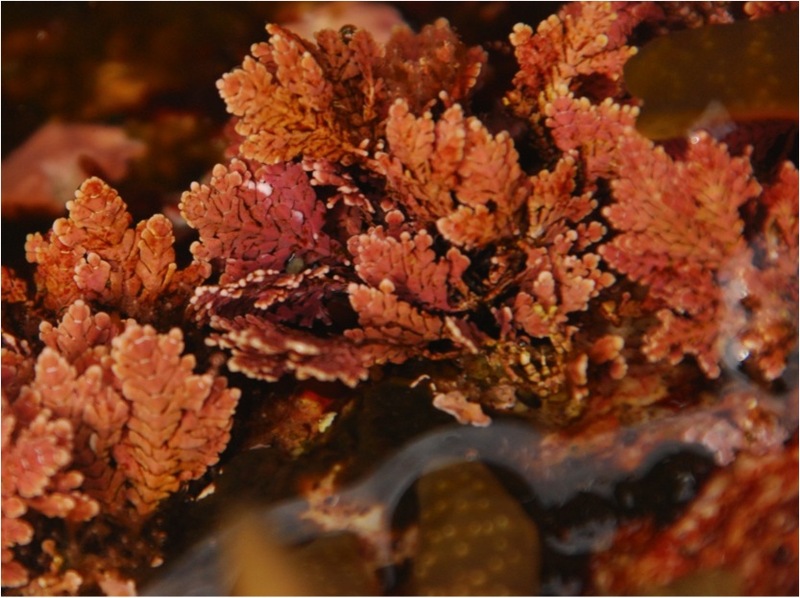 Recently over 40 genetically distinct coralline algaes were identified on Calvert Island by Hakai Institute researchers* (Hind et al. 2015). Some of these are encrusting and some are upright (articulated) like B. frondescens; nevertheless differentiation in the field may be impossible for some of these species. However B. frondescens is one of the species that can usually be distinguished by morphological features visible in the field: small bumps, tipped with holes, are found on the ends or sides of branch segments (or both). These structures, known as conceptacles, are indicated with arrows in images C and D of this figure. This species can be found growing on rock in the intertidal of exposed or protected shorelines. A recent study reported it mostly in the mid to high intertidal, and uncommon in the low intertidal and in tidepools. Its confirmed range extends from Bering Island in the Commander Islands, Russia, to Marin County, California. *Note that a recent study, resolving existing new Bossiella species and describing new ones, found a significant overlap in morphology between the seven species studied (Hind et al. 2015). Hind, K.R., Miller, K.M., Young, M., Jensen, C., Gabrielson, P.W., and Martone, P.T. (2015). 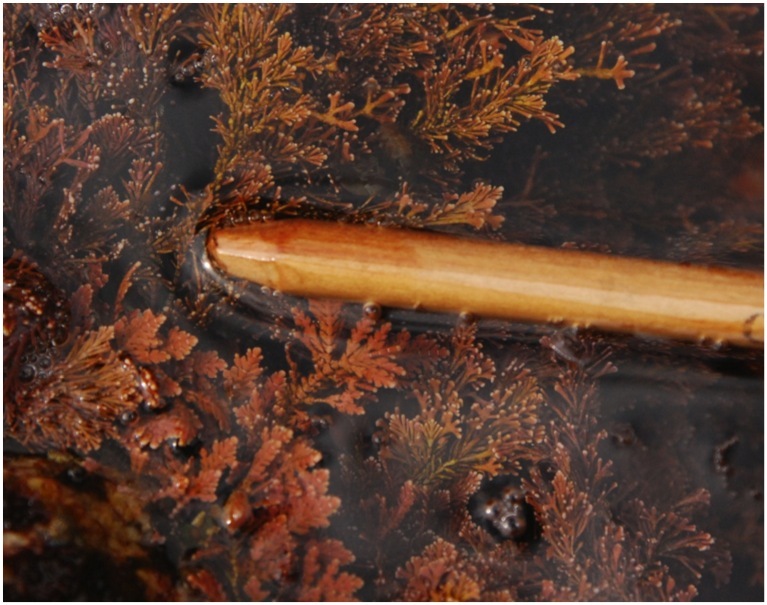 Resolving cryptic species of Bossiella (Corallinales, Rhodophyta) using contemporary and historical DNA. American Journal of Botany. 102(11):1912-1930. Lindberg, M. and Lindstrom, S. (2010). Corallina frondescens Seaweeds of Alaska. Accessed 30/07/2014.